The Model 45A00-1 Supervised Wireless Receiver allows up to 64 unique wireless security transmitters to report information to an HAI controller. The wireless transmitters replace wired door and window sensors, as well as wired smoke, motion, glassbreak detectors, and handheld keyfobs. These transmitters report status information to the 45A00-1 Receiver which, in turn, processes the information and reports it to the HAI controller. This receiver is equipped with RSSI (Received Signal Strength Indication) to help an installer determine if transmitters will work where they are placed. 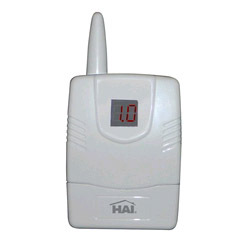 COMPATIBLE TRANSMITTERS: The Model 45A00-1 Supervised Wireless Receiver is compatible with HAI Wireless Transmitters. These transmitters include the 46A00-1 Door/Window Transmitter, 47A00-1 Quad Pet Immune Motion Detector, 48A00-1 4 Button Keyfob, 49A00-1 Smoke and Carbon Monoxide Detector, 50A00-1 Panic/Alert Pendant, 56A00-1 Wireless Recessed Door, 58A00-1 Mini Door/Window Transmitter and 61A00-1 Glassbreak Detector.